We will be presenting our quality and production management solutions at the Control in Stuttgart – the world’s leading international trade fair for quality assurance (07-10 May 2019). Grab a refreshing cocktail at our CAQ AG Factory Systems cocktail bar and join us: Hall 5, Stand 5502. CAQ AG will be presenting its sophisticated quality and product management solutions at the MedtecLIVE trade fair from the 21st to the 23rd of May 2019 in Nuremberg, Germany. Come visit us at stand 9-311 in hall 9 and find out more. We will be presenting our quality management solutions at the Hannover Messe together with our partner Forcam. Come visit us in Hall 7, booth A11. There’s a lot happening in the world of quality management. In order to ensure that you’re always kept up-to-date with the latest developments in this often highly complex field, we would like to invite you to our Quality Excellence Days 2019. Whether handling, damping, linear, machine tooling, system, or process technology – Zimmer Group brings together a vast variety of different technologies in one brand. With consistent growth and branches and sales partners in 28 countries, the company has over the years developed into a true global player. 1,300 employees however only mark the beginning for Zimmer group, as revenue growth has consistently been double-figures for years now. In order to ensure that the quality of its products and processes can keep up with this rapid growth, the company has been successfully relying on software solutions by CAQ AG since the year 2004. The year 2018 brought a whole host of innovations to our CAQ.Net software. However, none of these would have been possible without you – our customers. Your input enabled us to learn a lot about how our software is used in the field and precisely develop and introduce optimizations and innovations into our software family. We are very proud of the great ties we enjoy with our customers and look forward to realizing many more wishes and optimization suggestions in the future. The new 2019 GFQ catalogue contains all important information and dates regarding the GFQ Akademie’s CAQ.Net user workshops. Whether you are using Process.Net, Compact.Net or REM.Net - The user workshops are the perfect addition to the CAQ AG software family. Our all new Quality Assurance with CAQ.Net / Quality Management with CAQ.Net workshops in English may be of particular interest to you. The year 2018 is slowly but surely coming to an end and it is time to start looking ahead to 2019. In order to ensure that you continue to be as well organized as you were in 2018, we are once again offering our customers a 70 x 100 cm CAQ AG annual planner. Please note that the calendar is designed for the German market and, hence, only features German public holidays and school holiday listings. 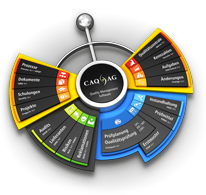 CAQ AG will be presenting its software solutions at this year’s LIMS Forum in Jülich from the 13th to the 14th of November in Jülich, Germany. Whether sales numbers, machine downtimes, or complaint costs – data is gathered in every corner of the company. However, regardless how comprehensively or precisely data is gathered, it remains worthless if it cannot be evaluated. Data evaluation software is designed to make sense of data and turn it into information. The Quality Excellence OnSite events allow you to see first-hand how our quality management solutions are put into practice by users and learn how the individual modules can assist you in your everyday processes. This year’s Quality Excellence OnSite event was conducted on the 14th of June in cooperation with our long-time customer Jungbunzlauer Ladenburg GmbH. Interview with Automobil Produktion: "Fulfilling Standards Alone Does Not Lead to the Top"
Quality assurance is primarily the supplier’s job. This way of thinking, still often practiced by OEMs around the world, may come to an end in September 2018 when the new IATF 16949 comes into effect. Florian Schwarz, CEO of the German quality management software maker CAQ AG, says that now’s the time to make a virtue out of necessity: action instead of reaction is the advice he gives to companies that wish to excel in their quality management. We will be presenting our quality and production management solutions at the Control in Stuttgart – the world’s leading international trade fair for quality assurance (24-27 April 2018). Grab a refreshing cocktail at our CAQ AG Factory Systems cocktail bar and join us: Hall 5, Stand 5512. CAQ AG will be presenting its sophisticated quality and product management solutions at the MEDTEC Europe trade fair from the 17th to the 19th of April 2018 in Stuttgart, Germany. Come visit us at stand 9F10 in hall 9 and find out more. The Quality Excellence OnSite events allow you to see first-hand how our quality management solutions are put into practice by users and learn how the individual modules can assist you in your everyday processes. Apart from introducing the latest innovations and conveying the latest news from within the world of CAQ-software and quality management in general, these events primarily serve as a forum where you can discuss CAQ and quality-related topics with us and other users. Companies in the foodstuffs industry today must grasp the advantages provided by digitalisation and software in their everyday quality processes in order to stay ahead of their competition. Visit us at the Anuga FoodTec in Cologne and find out how our products allow your company to keep up with the quality expectations of your customers and ever increasing quality assurance regulations. With annual revenue of over 700 million Euros and 1,060 employees in Germany, Austria, Canada, and Switzerland, Jungbunzlauer is one of the international leaders in the field of biologically degradable product ingredients. GAPLAST GmbH is an innovative developer and producer of packagings, applications, and disposable products for use in the pharmaceuticals, medical-technology, and cosmetics industry. Founded in the Bavarian town of Saulgrub-Altenau in 1969, the history of the company began with the development of an innovative sealing plug for tablet packaging.